We show examples of a variety of anime characters and animations at 1024x1024 resolution generated by Progressive Structure-conditional Generative Adversarial Networks (PSGAN). 1. We first generate many anime characters using our network from random latent variables and create new characters by interpolating them. 2. 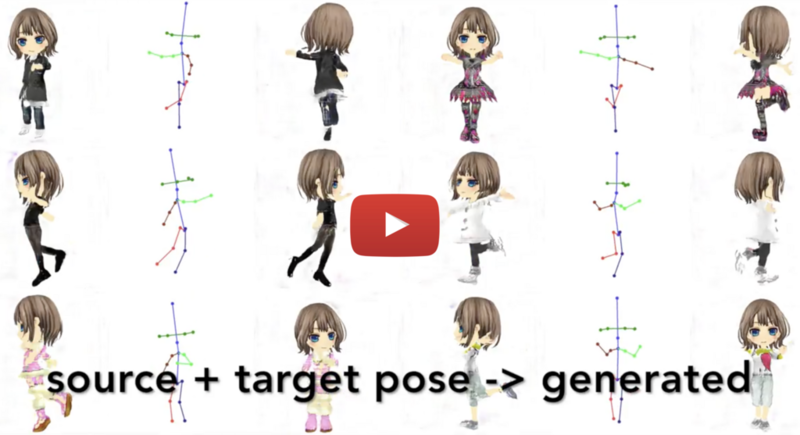 Next we give continuous pose sequence information to the network to generate an animation video for each character. In this video we repeat 1 and 2 several times. We show examples of a variety of anime characters and animations at 1024x1024 resolution generated by Progressive Structure-conditional Generative Adversarial Networks (PSGAN). By fixing the latent variables (representing character visuals) and giving continuous pose sequences to PSGAN, we can generate an animation for each character.